What do you do when you find that your food is cold by the time you get ready to eat it? Well, one suggestion would be to ask to have it reheated. The other suggestion would be to stop joking and laughing with your dinner partners so that you can eat the food while it’s hot. My friend and I chose a Swedish restaurant on Chicago’s North Side at 3258 West Foster Avenue. It was’t just us this time. Two of my old co-workers joined us and in addition to outstanding food, we had laughter and comedy for the three hours we were there. People with high technical aptitude are stereotypically known for being boring, but not the four of us on this evening. Not only were we not boring, but we were well fed. Because the weather was beautiful, we decided to sit outside and enjoy the great view and temperatures. We started off with complementary bread and crackers that we gobbled up while making fun of work — well our past jobs for two of us who fled a rather blah place of employment. 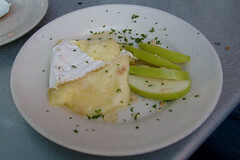 As complementary food is great for whetting the appetite only, we added to the appetizer list by ordering sill tallrik and soft brie with slices of green apple. 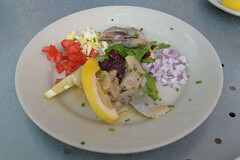 The sill tallrik were two types of pickled herring, which seems to be a favourite delicacy in Western Europe. I could understand why because the pickled herring was delicious. We asked for more complementary bread so that we could spread the soft brie on it. We had already determined that it was all uphill from this point. The entrées were so good that they had that effect that I usually experience when I’m eating lip-smacking good food. I wanted to dance and I’m not a dancer. 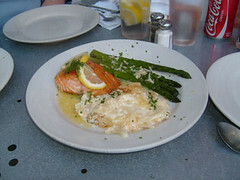 We had norsk lax which was Norwegian salmon broiled with chive beurre blanc, served with au gratin potatoes and parsley. Let me just say that the au gratin potatoes did not come out of a Betty Crocker box. The things were ridiculously good. Oh, that’s not all. We had flaskfile. 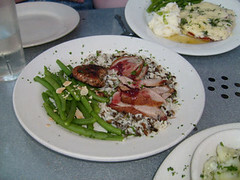 This was pork tenderloin with savoury applesauce and braised red cabbage served up with rice pilaf and green beans. I’m not a fan of pork, but this dish was worth ordering another plate. But that’s not all. 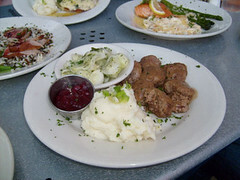 A third plate we ordered was kottbullar, Swedish meatballs with lingonberries, cucumber salad, and mashed potatoes. The mashed potatoes were so good that they didn’t require gravy and Tre Kronor truly did a fabulous job with the Swedish meatballs. The fourth dish we ordered was kycklingfilè. 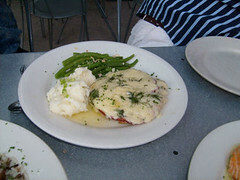 This was a chicken breast, ham, and djarlesberg cheese with mashed potatoes and green beans. It was yet another unnecessarily good dish to the point of us thinking how much we appreciate good food. I guess that goes without saying. Even though we had survived stuffing ourselves with the appetizing appetizers and the mouth watering entrées, we had enough room left for dessert. We were dangerous also. We ordered four dessert. “Oh my God!” you say as you press your hand to your chest in shock. 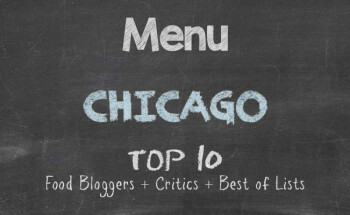 We had a custard with a caramelized topping, a chocolate mousse that no one should eat in public, a lemon tart that swear was finally done right by someone, and blueberry soup that was surprisingly tasty although different. Tre Kronor apparently was once an actual house that the owners converted into a restaurant. After dinner, I went to wash my hands and the bathroom was upstairs. Notice I said bathroom as opposed to washroom. You can let a bath, soak in the tub, and relax after a heavy meal like what we had. I’m sure other customers who are full of drink and in need of using the loo would not be pleased if someone were basking in a bubble bath with a glass of wine. Talk about making customers feel at home. Here is the shameless plug. For all of the eating, and I will remind you again that everything was outstanding, the price was the biggest shock. We didn’t hear the cha-ching sound and laughter from the kitchen. The next time we go, we’ll have to go with sullen and sombre spirits so that we’re not laughing so much. 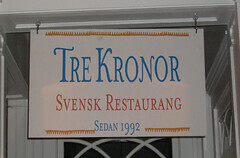 The food at Tre Kronor is tasty, but not spicy such that those with mild palates would have fits. We enjoyed the food, which is rhetorical, and it goes without saying that will shall return — at least ten more times this year.